PRICE: $12.00 which includes US shipping. This next Wolfpak Decals sheet continues with somewhat modern grey painted aircraft (many of us long for a return to color in military planes, but it just isn't going to happen). In this sheet we get five different aircraft, some from the first Gulf War. The initial offering is an F-16C from 310 FS/56 FW based at Luke AFB in late 2006. This is an ATC unit training pilots on the block 42 F-16. Next is the lone USN option, a VA-46 aircraft from Desert Storm in 1991. I can recall seeing this overall FS 36320 A-7E sitting in the boneyard at NAS North Island soon after the A-7 was removed from fleet service. The F-15A is one of the ASAT test aircraft flown from Edwards AFB in 1986. As many of you know, the only unit to go operational on this weapon was the 318th FIS and then only for a very short period of time. The sheet includes all the yellow stripes used on the ASAT itself. Another Desert Storm plane is an EF-111A from the 42nd ECS during 1991. This one has some fuselage art and an impressive mission tally. The last option is a biggie. This is an EC-130H from the 41st ECS operating out of Davis-Mothnan AFB in January 2008. 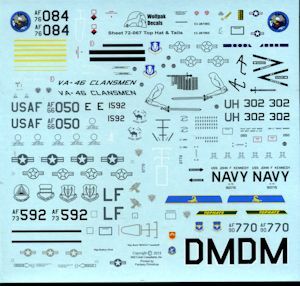 The instruction sheet for this set is the best in the business when it comes to background information and what may be needed to accurately depict the aircraft being modeled. 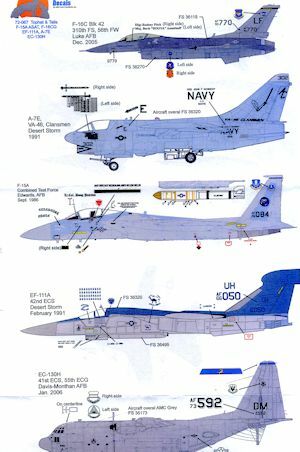 In addition to the actual placement profiles, there are several additional pages of information that include a history of the type, kits and update bits for these schemes, as well as load-out information, and any changes needed to properly model the aircraft in question, assuring you of the most accurate model you can have. A listing of kits and conversion sets is also included.